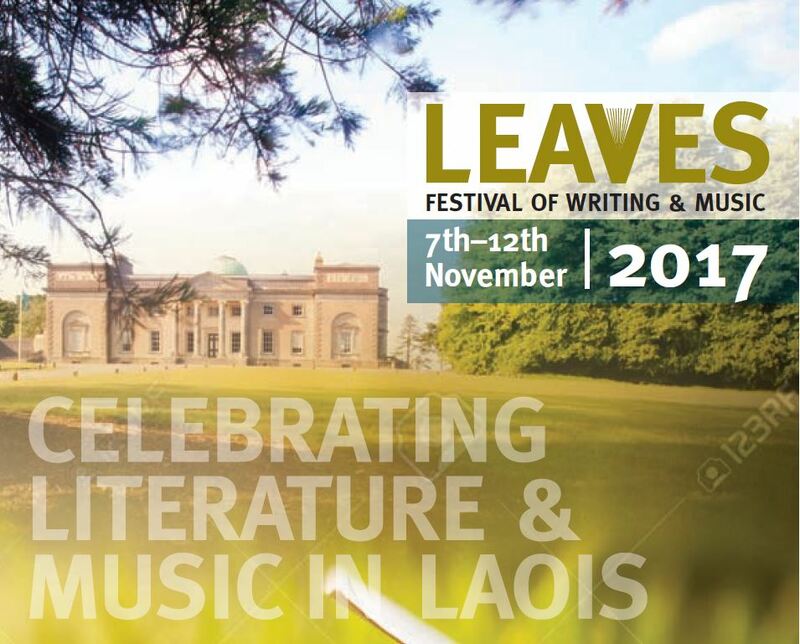 The annual Leaves Festival of Writing and Music is just around the corner. 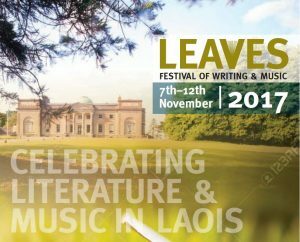 Leaves celebrates the diversity and richness in today’s literary, music, theatre and film scene. Leaves aims to excite and engage with audiences young and old. Opening the weekend in the Drawing Room, Emo Court, on Friday night 10th November, at 8.00pm are poets Jean Ó Brien, Martin Figura, and Helen Ivory. They will be joined by musician, Úna Keane and the event will be chaired by Arthur Broomfield. The Tea Rooms in Emo Court is the venue for Saturday mornings writing workshop, to be led by Helen Ivory. It runs from 10am-12.30pm on Saturday 11th November. Returning to the Drawing Room for the rest of Saturday’s events(11th November), are poets Denise Curtin, Paddy Moran, Karen J Mc Donnell, joined by Portlaoise born musician, Gary Dunne. This event will be chaired by Séamus Hosey and commences at 3.00pm. 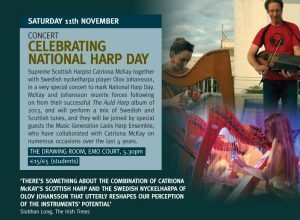 To celebrate National Harp Day, Scottish Harpist, Catriona McKay together with Swedish nyckelharpa player Olov Johansson, will perform a special concert. 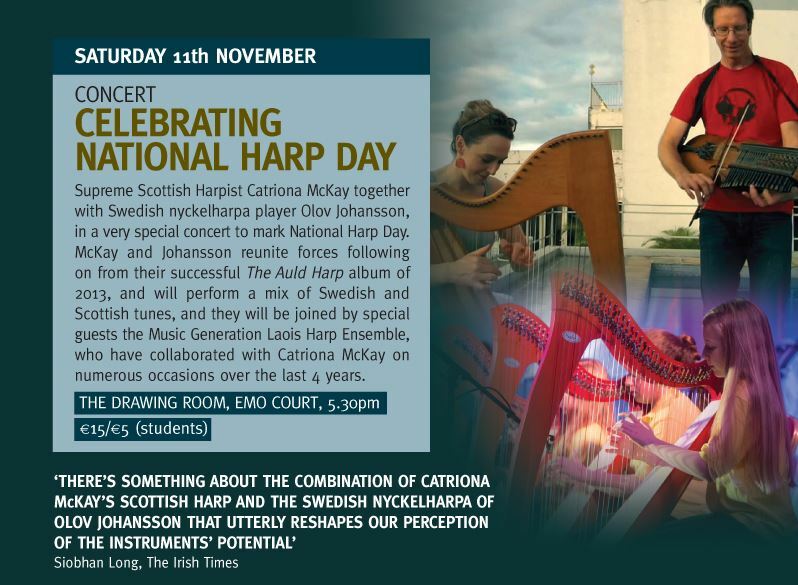 They will be accompanied by the Music Generation Laois Harpists and it commences at 5.00pm on 11th November. Saturday evening (11th November) will feature Lisa Harding and Kevin Barry reading and discussing their novels with Sean Rocks, presenter of Arena, on Radio 1 and it commences at 8.00pm. On Sunday at noon, 12th November, the Drawing Room will be the setting for the premiere of Thresholds. This new music commission celebrating the theme of pollination, by Ian Wilson will be performed by saxophonist, Cathal Roche. It was funded through the Creative Ireland Laois programme. The winning poems on the theme of pollination will be read by the prizewinners at this event. The new Laois Spoken Word artist, who will commence their ten month residency during the Leaves Festival will be introduced to the public at this gathering also. During their residency the Spoken Word artist will work with young people throughout the county, through secondary schools, Youth Theatre and Youthreach. The Dunamaise Arts Centre, Portlaoise has scheduled events for Leaves, including cinema; My Cousin Rebecca and the live broadcast from the Harold Pinter Theatre, London of Who’s Afraid of Virginia Woolf. Dubliners’ Women, by Katie O’Kelly, featuring female characters from James Joyce’s Dubliners, will be performed. Readings in the schools and libraries will be by Helen Ivory, Martin Figura and Alan Nolan. 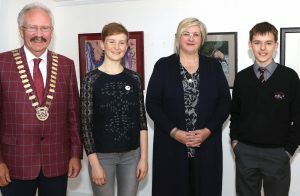 The artistic talents of the young people of Co. Laois, and the contribution they have made towards the success of the Texaco Children’s Art Competition, now in its 63rd year, were celebrated in a week-long art exhibition entitled ‘Time and Space’ – A Celebration of Texaco Children’s Art Success in Laois’ which opened at the Laois Arthouse Gallery, Stradbally on Thursday 21st September. At the Official Opening of the ” Time and Space ” Exhibition – a celebration of Texaco Children’s Art Success in Laois , at the Laois Arthouse Gallery, were: Clr. Padraig Fleming ( Cathaoirleach Laois County Council ), Lucy Deegan ( Texaco Winner/ Culture night Ambassador ), Muireann Ni Chonaill ( Laois Arts Officer )and Ciaran Leonard ( Texaco Winner ). Photo: Michael Scully- no reproduction fee. Curated by Lucy Deegan, the 2017 Laois Culture Night Ambassador, the exhibits included the colourful portrait study of her brother Tom, carefully executed with colouring pencils and white gel pen, which won Lucy the top prize in the 63rd Texaco Children’s Art Competition. Also amongst the exhibits at Stradbally were works by three other Laois students all of whom featured highly in the competition this year. A portrait study entitled ‘Weathered Wisdom’ by 13-years old Ciarán Leonard, a pupil at St. Mary’s CBS Portlaoise, which took second prize in the 12-13 years age category. Other young Laois winners whose winning works featured were sister and brother Asma Zulfiqas (age 14), from Scoil Chríost Rí, Portlaoise and Abdul Ahad Zulfiqar (age 6), from Holy Family Junior School, Portlaoise. A pupil of Gaelcholáiste Cheatharlach in Carlow Town, Lucy Deegan is the daughter of well-known tourism industry figure, Jim Deegan – founder of the Railtours Ireland First Class organisation, and his wife Fionnuala – herself an accomplished animation artist whose work features in Hollywood blockbusters ‘An American Tail’ and ‘All Dogs Go To Heaven’. No stranger to the Competition, Lucy has featured amongst the prizewinners on five occasions to date. Her three siblings, brother Tom and sisters Annie Rose and Juliet, have also won prizes in previous years. As part of her prizewinning package, 17-years old Lucy from Luggacurran received a top prize of €1,500 plus an invitation to visit Tokyo awarded by the International Foundation for Arts and Culture where she was an honoured guest at a ceremony held in conjunction with the 18th International High School Arts Festival in which her winning artwork was exhibited. Underlining the support that exists for the Texaco Children’s Art Competition is the fact that, over the past five years alone, some 2,799 entries were received from young Laois artists – a figure that confirms the view that the number of entries submitted by Laois students since the competition first began in 1955 amounts to some tens of thousands. 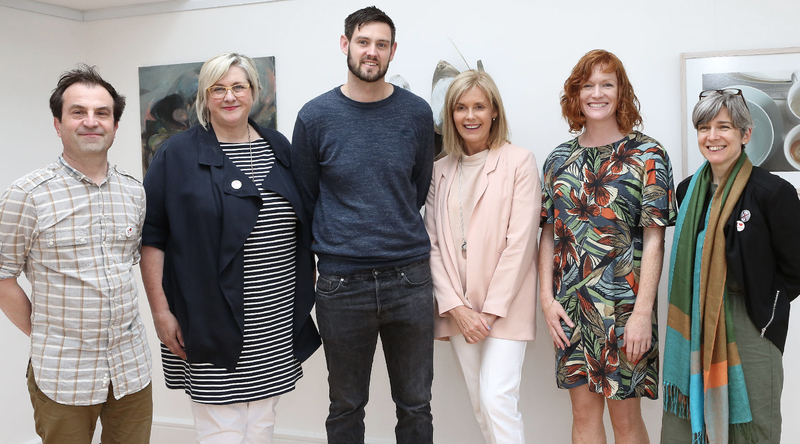 County Laois Arts Officer Muireann Ní Chonaill and Dublin gallerist Olivier Cornet met for the first time at the Speed Curating event arranged annually by Visual Artists Ireland (VAI) as part of their artists’ Get Together at the Irish Museum of Modern Art (IMMA). Through working side-by-side in the chapel at IMMA, meeting artists at this event, the idea for the joint exhibition was born. 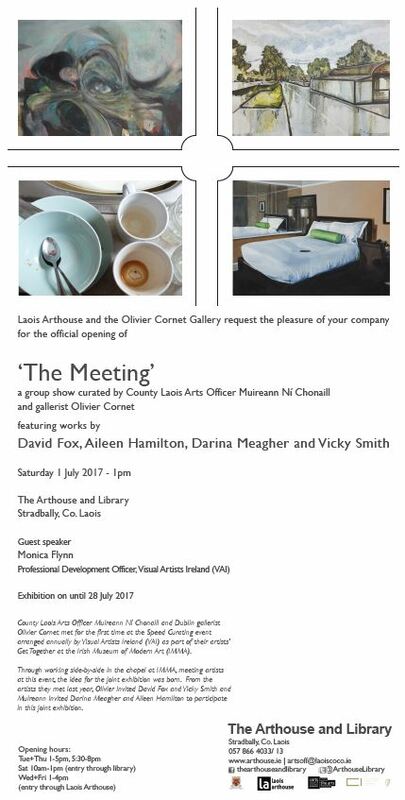 From the artists they met last year, Olivier invited David Fox and Vicky Smith and Muireann invited Darina Meagher and Aileen Hamilton to participate in this joint exhibition. Currently, he is both living and working in Belfast, and has a studio residency at Creative Exchange Artist Studios, in East Belfast. 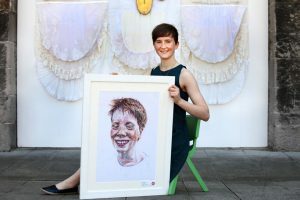 Fox has exhibited both nationally and internationally including the Galway Arts Festival in 2009, Belfast’s Platform arts gallery in 2011 and the Luan Gallery, Westmeath in 2015. He has exhibited at international art fairs including Positions art fair, Berlin and international solo exhibitions at Galeria Silvestre, Tarragona Spain. Most recently, he had a solo show, ‘A road less travelled’ at An Chultúrlann in Belfast. Aileen Hamilton considers ecological cycles and organic process within her drawings, exploring the delicate balance and repetitive patterns that bind the natural world to form. Isolated landscapes appear suspended or floating in a fragile and exposed state as Aileen explores the physical and mental borders of our world. In doing so, she reveals hidden layers and draws an analogy between the internal terrain of the body and the wider ecosystems in which we live. Landscapes bend as if in a space-time continuum, the exploratory folds evoking the artist’s search for meaning in both micro and macro environments. The interplay between 2D and 3D environments is an integral part of the process in which Aileen moves back and forth between depth and flatness, her drawings growing out of the wall and interacting with the architectural space. In creating these hybrid landscapes, Aileen is drawn to the thin yet fibrous quality of paper, a material both fragile and solid which she progressively allows to find its own form of existence. “I am currently based between Barcelona and Ireland. Originally from a rural part of County Meath, I am continually inspired by home, my travels and our connection to the land. In my drawings, I investigate themes of dis-location and our relationship with a changing landscape. The interplay between 2D and 3D environments is an integral part of my process where I move back and forth between depth and flatness, with drawings growing out of the wall and interacting with the architectural space. Muireann met the artist at Visual Artists Ireland’s Speed Curating event at IMMA in August 2016. Meagher’s work is an on-going investigation through the medium of paint and the simple act of mark-making. She explores new ways of seeing and experiencing the world, always seeking that juncture within artistic process, which allows the infra-thin to occur. With an Honours B. Des and an MA in Visual Communication, from the National College of Art and Design in Dublin, Meagher spent many years working in the area of design and visual communication. A deep interest in the hand-made has led her to contemporary painting. Awarded a BA (Hons.) in Visual Arts Practice at the Institute of Art, Design and Technology, Dun Laoghaire in 2011, she completed a Masters in Fine Art Painting at the NCAD, Dublin in 2014. Winner of the Peter O’Kane Solo Exhibition award at the RDS Student Awards 2011, Meagher also completed a three-month studio residency at the RHA, in 2015. 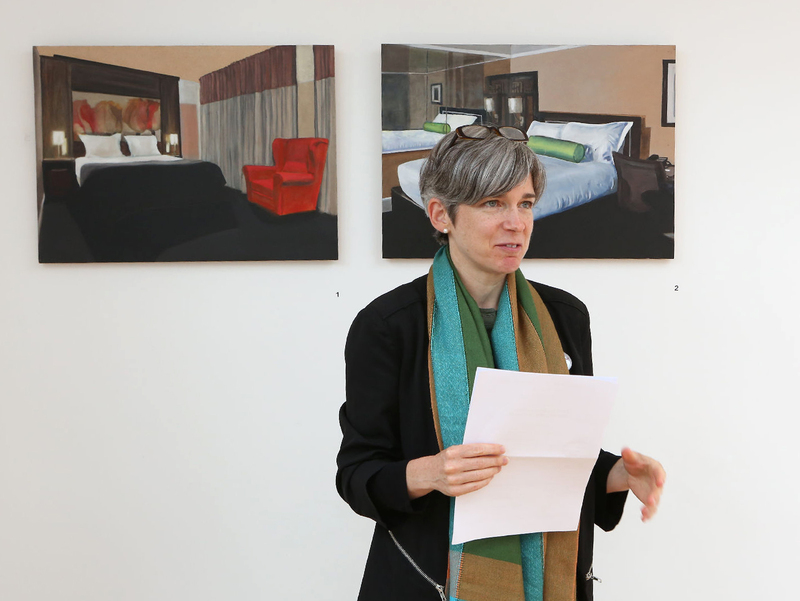 Recently, Meagher was presented with a residency at Arthouse, Stradbally, this was awarded at the Dunamaise Arts Centre Annual Open Submissions Exhibition in November 2016. Meagher has exhibited extensively. Muireann met the artist at Visual Artists Ireland’s Speed Curating event at IMMA in August 2016. 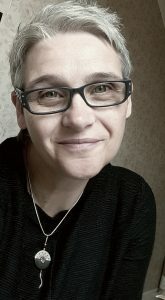 Vicky Smith is an award winning visual artist who is a member of Engage Art Studios in Galway. Her practise is rich and a complex language in a variety of mediums-small drawings, paintings, film to installations predominately installation based often composed of paintings, photographs, sculpture, text, found objects and film that explore feminist concepts. The bell jar is motif for the complex installations of enclosures. Performance films and appropriated films are an enjoyment of this enclosure, the isolation bell jar of a female experience. Her artistic concern is female identity within the domestic setting, the social setting and the workplace defined by traditional roles of house wife, work, woman. The work is rooted in being a woman a female artist, what this means, the made boundaries. ‘HouseWork, Woman, Wife’ is a series of photo stills reflecting a suburban housewife’s realisation that maybe all of her life will end up with invisible, repetitive, uncreative housework. The film on which these photo stills are based is a non-narrative study of domestic labour, work that seems not to be taken seriously by society at all. The whole notion of women being housewives has changed. Do you talk about yourself as a housewife? Most of the change that has happened since the 70’s is a superficial inequality of responsibility. 70% of British and Irish women said they are mostly responsible for housework. Men did housework, he helped her with the housework not the other way round. The 1970s is still happening now. This body of work explores the space between the individual domestic labour and society’s economic workplace through the lens of a personal story of a newly-married woman who finds herself temporarily out of work. She marks time through the act of housework. Olivier met the artist at Visual Artists Ireland’s Speed Curating event at IMMA in August 2016. Since then the artist has become an AGA member (Associate Gallery Artist) of the Olivier Cornet Gallery. 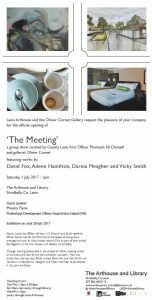 Friday the 9th of June 2017 at 4.30 saw the launch of an exhibition of a body of artwork from “Painting and Drawing in Light, Mood and Movement”, at the Laois Arthouse, Stradbally. 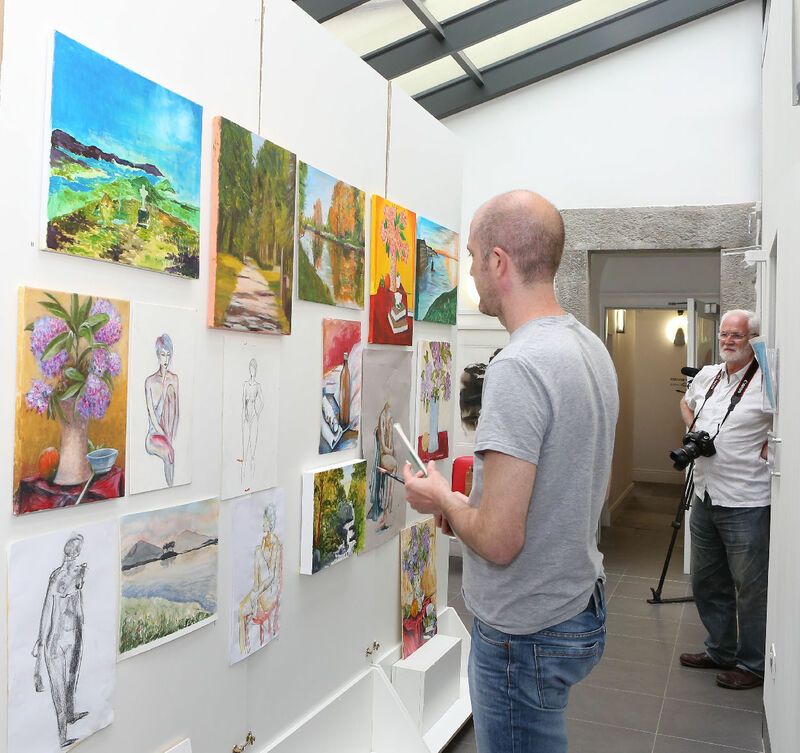 The exhibition included selected work from a three day summer painting programme for adults led by renowned artist John Keating, from the 7th to the 9th July and also included some wonderful work by the artist himself. 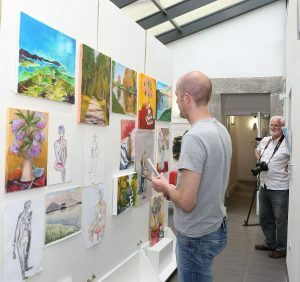 As well as Laois artists taking part, the course attracted artists from a number of different parts of the country including: Dublin, Westmeath, Tipperary, Limerick, Kildare, and Offaly. The Cathaoirleach of Laois County Council Tom Mulhall launched the exhibition. 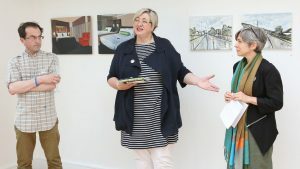 In his address he welcomed all the artists to the Arthouse, he congratulated them on the quality of their work and he thanked everyone involved in running the programme. The project was documented throughout by artist Lisa Fingleton and curated by Muireann Ní Chonaill, Arts Officer. 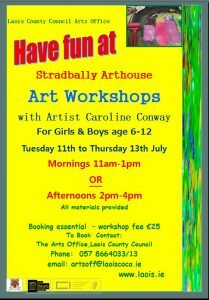 “Painting and Drawing in Light, Mood and Movement”, is the title of the forthcoming Summer Art programme for adults in the Laois Arthouse. It will be directed by acclaimed painter John Keating. It takes place on 7, 8th and 9th June from 11.00am to 4.00pm daily and the cost is €80 per person. Over the three days the participants will focus on a number of areas including still life- observational line, texture form and composition in various techniques; the figure- drawing and painting the figure through gesture, movement and static form; a sense of perspective- developing painting or drawing with the emphasis on spatial dimensionality and creating the illusion of space through light, tone and depth. Born in Tipperary in1953. John Keating studied at the Crawford College of Art, Cork, Trinity College, Dublin, Loughborough University, Leicestershire and The Arts Student League of New York, which he attended on a scholarship. 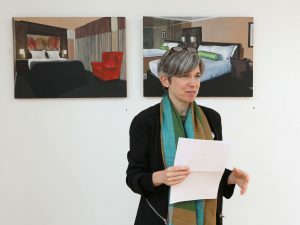 Keating has exhibited nationally and internationally including exhibitions in the U.S.A., Italy, Spain, Greece, Monaco and China. His work is included in private and public collections in Ireland, the U.S.A., Australia, Italy, Greece and England. 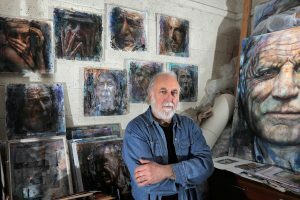 Keating has guest lectured and tutored on the drawing studies course at the National Gallery of Ireland, National College of Art and Design, Dublin Institute of Technology. There will be a closing reception on Friday 9th June at 4.30pm where a selection of the participant’s works and John Keating’s paintings will be exhibited. The exhibition will be on show until the end of June. 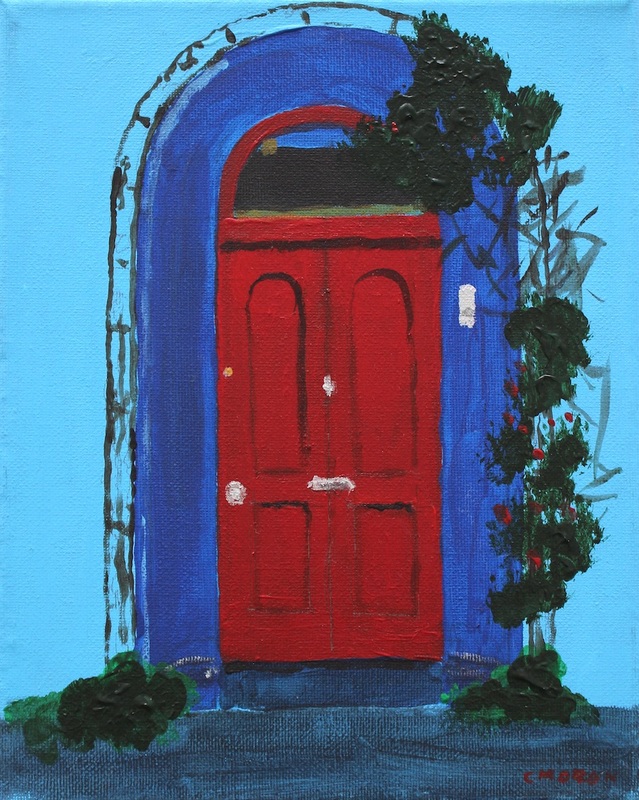 The Stradbally branch of the Active Retirement Association (ARA) will launch their art exhibition entitled “Doorways of Stradbally” at the Laois Arthouse Gallery, Stradbally on Saturday 6th May at 1.30pm. The exhibition will be officially launched by Anna May McHugh, the Managing Director of the National Ploughing Association of Ireland. Included in the exhibition are twelve wonderful original paintings, each depicting a different historic doorway in the town. The Active Retirement Group wanted to leave its stamp on the annals of Stradbally in some way. Chairperson of the group Ette Kennedy suggested that they paint some of the Doorways on the Street in Stradbally. This original idea captured the imagination of the artists of the group and thus the “Doorways of Stradbally” was born. Seven members took on the task and these include; Chrisse, Christy, Ette, Mary, Michael, Phyllis and Vera. All paintings will be for sale with proceeds going back into the ARA. The Stradbally ARA has been established for three years and currently has twenty members. It is an open and inclusive organisation who aim to support and empower retired and semi-retired individuals in their community through a wide range of activities. 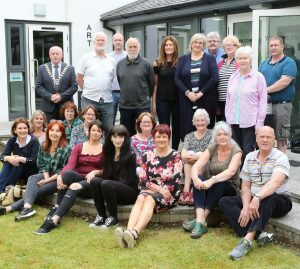 Commenting on the upcoming exhibition Anna May McHugh said “I extend my congratulations to the Stradbally Active Retirement Group on their initiative and I sincerely hope their work will be appreciated”. 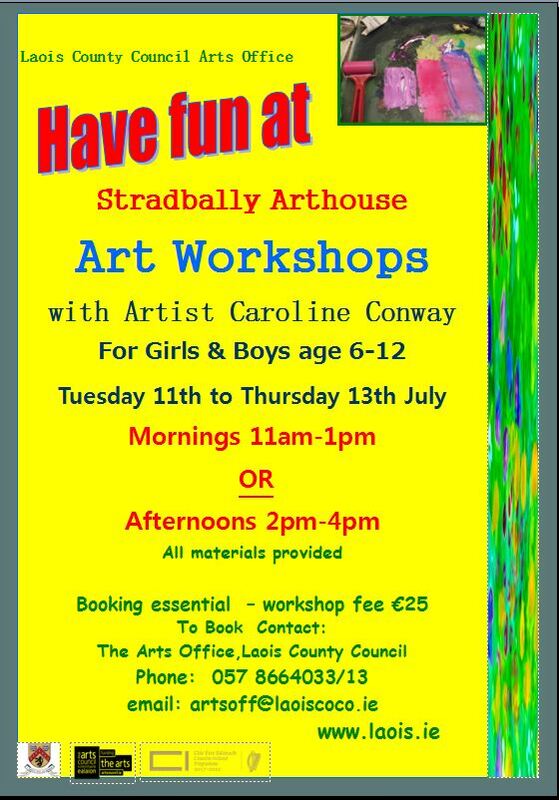 Visitors are welcome to view the exhibition at the Laois Arthouse Gallery in Stradbally from Saturday 6th May until the closing date on Thursday 1st June.